FOSS Patents: Qualcomm drops a patent asserted against Apple in an ITC complaint: "we hardly knew ye"
Qualcomm drops a patent asserted against Apple in an ITC complaint: "we hardly knew ye"
In early July, Qualcomm brought an ITC complaint against Apple over six non-standard-essential patents (NEPs) related to efficient battery usage, seeking an import ban against iPhones with Intel (or other third-party chips) but not against devices that might include Qualcomm's own chips. A couple of weeks ago, the ITC instituted the investigation. As I wrote last month, it would have been unusual for the ITC not to investigate the complaint, despite the partly valid points raised in various public-interest statements. But something unusual has happened now. On Friday, Qualcomm filed a motion (unopposed by Apple) for partial termination of the investigation by withdrawal of U.S. Patent No. 8,487,658 on a "compact and robust layout shifter design." 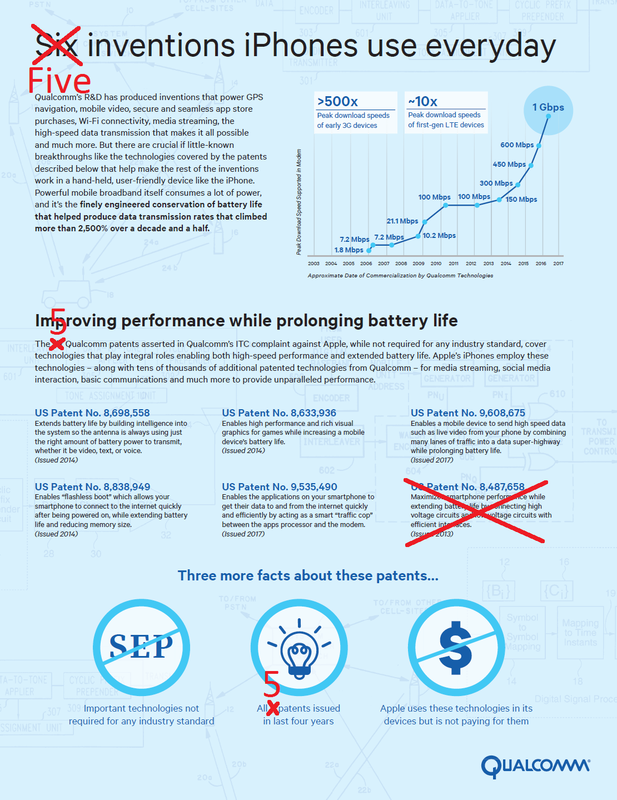 What's unusual here is not Qualcomm's decision to drop a patent. I'm sure they'll drop more as this investigation unfolds because that's what the ITC expects complainants to do so it can keep its relatively ambitious timelines (Qualcomm's motion makes reference to the normal course of business at the ITC, though the motion tends to portray a totally ordinary ITC timeline as something special, which it is not in my observation). What is strange and even pretty much unprecedented is the timing: two weeks into a just-launched investigation. In all other cases I've watched, with an exception I'll discuss next, parties withdrew patents after significant procedural progress. At a minimum, parties would want to review the respondent's non-infringement and/or invalidity arguments. 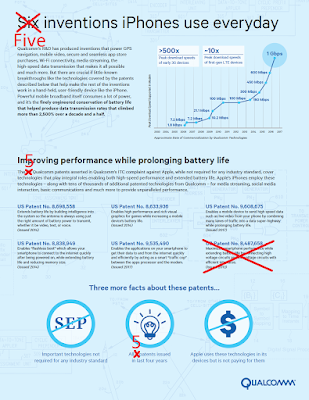 Here, Qualcomm withdrew the patent without anything happening other than Qualcomm having changed its mind. Approximately five years ago, then-Google-owned Motorola Mobility withdrew its entire second ITC complaint against Apple at the same procedural stage. But a withdrawal of an entire complaint is not the same thing as streamlining an investigation that is continuing. My guess is now, with the benefit of 2020 hindsight, that Apple would otherwise have filed a second complaint of its own against Moto, so maybe they agreed to at least cease further aggression. It still took a while (until May 2014) before Apple and Google withdrew all claims pending against each other, but there weren't any further infringement accusations between them (just fights over remedies and invalidity, and of course, appeals) between that withdrawal of Moto's second ITC complaint against Apple and the spring 2014 settlement. At a minimum, it was a gesture of deescalation--and "deescalation" doesn't appear to be in Qualcomm's vocabulary in connection with the Apple dispute.